A friend texted this morning and asked if we wanted to meet her and her granddaughter at the pool. Which translated into my kid playing with someone else while I sat in a lounge chair, chatted with my friend and worked through my back pile of Entertainment Weekly. I finally now know how Neil Harris Patrick prepared to host the Oscars. To make it even better, after we had already decided to go to the pool I received another text. This one was from the mom of Averiâ€™s best friend here. They were also going to the pool and were hoping Averi would join them there. They would be showing up around the time my friend left. Which meant we could stay longer, and I could move on from my old issues of Entertainment Weekly to the new ones. I now know where Amy Schumer got her start (Last Comic Standing) and that I really need to see her movie, Trainwreck. Plus I got to see lots of guys in Speedos. And orthodox women in full bathing suit material dresses. I love the juxtaposition of the two. Reminds me of last week when I volunteered at the school cafeteria, and saw a boy in a Yarmulke eating his kosher for Passover lunch of matzo, sitting next to a kid eating a ham sandwich, washing it down with milk, and capping the meal with a small chocolate Easter bunny. And they are the best of friends. I love it! We let Averi and her friend play all afternoon, both at the pool and then back at our place. They played so long that we needed to postpone using our Groupon at Captain Jims Fish Market and have dinner at home instead. Trader Joes to the rescue! I had a jar of curry simmer sauce in the pantry and some garlic naan in the freezer. All we needed was a vegetable. Obviously, my go to would be to add some spinach in with the chicken and simmer sauce and call it a day. 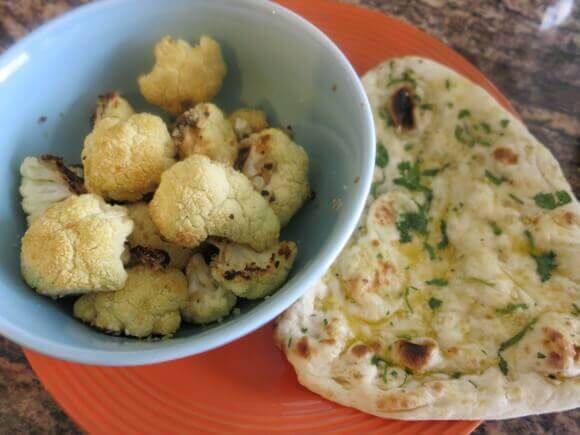 But the husband asked for cauliflower, saying it went best with Indian food. And then he even went to the grocery store to buy it. So I had no choice but to make it. And because I am so nice, I even made it the way he requested â€“ roasted. 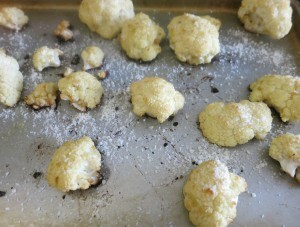 I have a recipe that I had pinned from stockpilingmoms. I like it because it is very straightforward, with minimal ingredients and effort. So minimal that I really didnâ€™t make any changes to the original recipe. I did opt to add the parmesan cheese at the end, which she says it optional. But really, in what world is cheese optional? Always necessary! 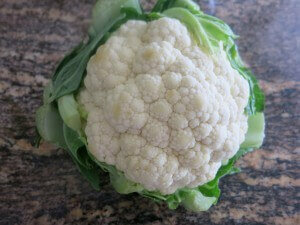 Make sure cauliflower is dry, so that seasoning will adhere to it and it will roast properly. 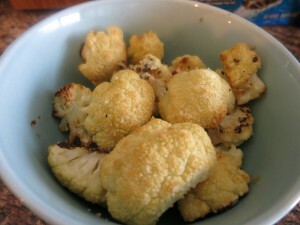 Place cauliflower, garlic, oil, salt and pepper into a bowl. Mix thoroughly, making sure cauliflower is completely coated. Spread out onto a baking sheet. 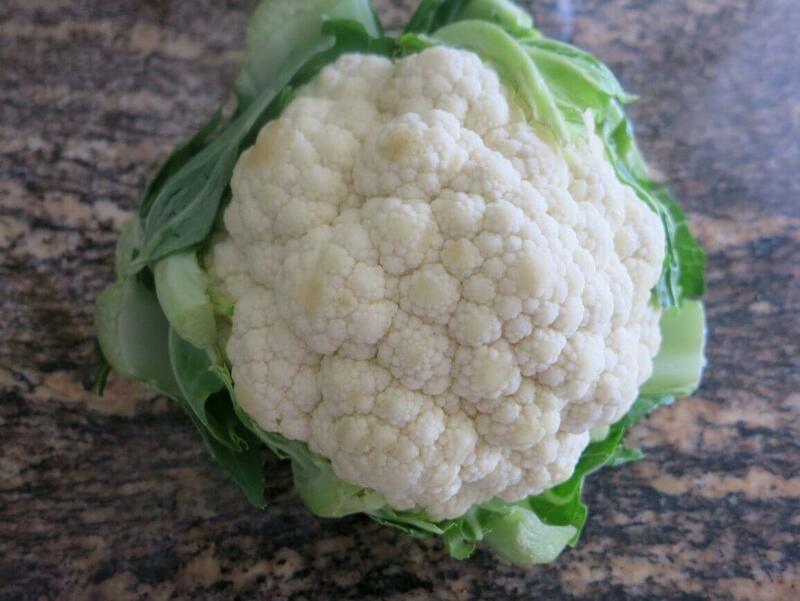 Bake for 25 minutes, until tops of cauliflower are browned. Remove from oven and sprinkle parmesan over cauliflower.